People today are increasingly becoming aware of their physical appearance. As such, Dermatology/Cosmetology is gaining much importance among people worldwide. Increase in income and availability of specialists has also surged the demand for cosmetology. This has led to innovation in cosmetic technologies as well. 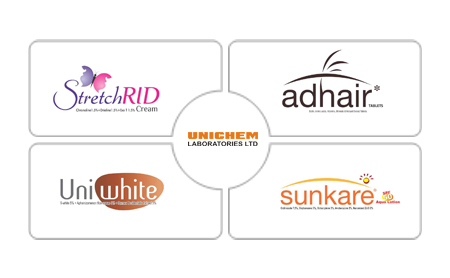 Unichem, in its efforts to stay at the forefront of pharmaceutical innovation, aims to develop high quality dermatological and cosmetic products and services. Unichem’s product portfolio is designed to meet the growing needs of the segment with a focus on treatment of acne, hair loss, immune mediated skin disorders, and skin infections. Unichem is pursuing to tap in opportunities in the growing markets. It is looking for in-licensing and co-marketing opportunities.